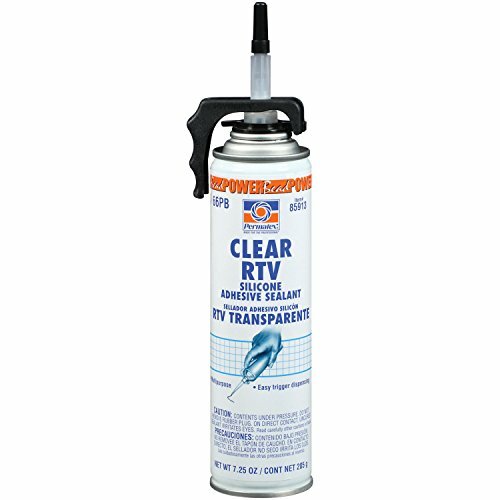 Permatex Clear RTV Silicone Adhesive Sealant is a general-purpose, black RTV indoor/outdoor sealant that bonds, seals, repairs, mends and secures glass, metal, plastics, fabric, vinyl, weather-stripping and vinyl tops. It protects and repairs electrical wiring and may be applied to horizontal or vertical surfaces. With a temperature range of -75 degrees Fahrenheit to 450 degrees Fahrenheit, this sealant resists oil, water, weather, vibration, and grease. From a trusted line of Permatex sealants for virtually any automotive sealing application. If you have any questions about this product by Permatex, contact us by completing and submitting the form below. If you are looking for a specif part number, please include it with your message. Insta Finish Performance Yellow Masking Tape (1.5 inch x 60 yards) 1 Case of 24 Rolls - Crepe Paper Industrial Grade - Easy Release Auto Body Tape 1.5"